A4 Size 7.3 x 10.3 in. (186 x 262 mm) 8.3 x 11.7 in. A4 Mounted 7.3 x 10.3 in. (186 x 262 mm) 11 x 14 in. SMALL 10 x 14.2 in. (255 x 361 mm) 12 x 17 in. (375 x 530 mm) 18 x 24 in. This rare thangka depicts the complete assembly of the twenty-one Taras according to the tradition of the early Indian Buddhist master, Suryagupta. There are essentially three main traditions that depict the twenty-one Taras, the first and most common being the Nagarjuna or Atisha tradition, where the Twenty-One Taras are virtually identical in their postures and appearance, except for their body colours and the colours of the vases they each holds in their lowered right hands. The second is the Longchenpa tradition, where all the Taras are likewise similar in their postures and appearance, except for their body colours, their facial expressions, and the specific attributes they bear upon the lotus flowers that each Tara holds in her left hand. And the third is the Suryagupta tradition, as represented here. 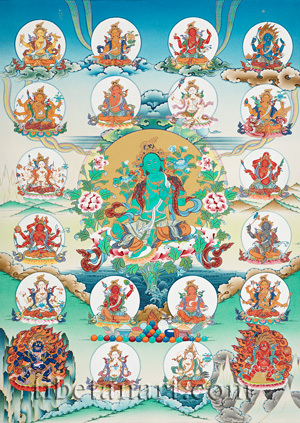 In the Suryagupta tradition each of the Twenty-One Taras appears in her own unique iconographic form, colour and posture, and because of this each of the Suryagupta Tara's were often painted separately as single-deity thangkas. So it is rare to find these twenty-one Taras assembled together in a composition such as this. Precise textual descriptions are given for each Tara in the Suryagupta tradition, and these details are accurately depicted in this composition. These details include the various colours of each goddess's lotus-throne, their facial expressions, and their specific and often obscure hand-gestures or mudras. According to the great Jonangpa master Taranatha (1575-1634), Suryagupta (Tib. Ni-ma sbas) was a scholar and Tara-siddha from Kashmir, and a contemporary of the two great 7th and 8th century Indian masters Candrakirti and Candragomin. Suryagupta upheld the philosophical doctrines of Nagarjuna and Asanga, and was renowned for having been a great Tara practitioner in seven of his previous lifetimes. In Kashmir and Magadha he established twelve Buddhist viharas, employing yaksha-spirits to supply the building materials, and protecting practitioners from the eight great fears. From Nagamitra he received the empowerment of Tara, and later became renowned as one fully skilled in the Hundred and Eight Tantras of Tara. He is said to have composed thirteen texts, such as the Tara mandala ritual and other Tara sadhanas that are now in the Tibetan Tengyur. Suryagupta’s principal disciple was Sarvajnamitra, who was likewise a great Tara practitioner and lineage holder. Pravira Tara, or "Tara the Heroine", is the first of the twenty-one Taras, and in this thangka she is depicted just to the left of Green Tara’s lotus seat. Pravira Tara is described as ‘emanating like a blazing mass of fire’ as she sits upon her lotus within a fiery triangular dharmodaya. She may also be described as ‘seated in the midst of space’ upon a white moon disc and a yellow lotus, which is how she is represented here. Pravira Tara is peaceful and red in colour, with one face, two eyes, and eight arms. She sits in vajra-posture upon a moon disc and a yellow lotus, with the full moon as her backrest. With her first pair of right and left hands raised or crossed above her head she ‘proclaims the dharma’ by making the two-handed ‘Great Bliss Gesture’ (Skt. mahasukha-mudra) as she holds a golden vajra and a bell. With her second pair of right and left hands she holds the drawn string of a bow in front of her heart, with its arrow aimed at the heart of an enemy. With her third right hand she holds aloft a golden wheel, and with her third left hand a white conch shell at the level of her navel. With her fourth right hand she wields a fiery wisdom sword, and with her fourth left hand a rope-noose. She is adorned with divine silk and jewel ornaments; crowned by white Vairocana Buddha, and her function is to swiftly overcome all hostile forces and accomplish various enlightened activities. Chandrakanti Tara, or "Tara white like the Autumn Moon", is the second of the twenty-one Taras, and she is depicted directly above Pravira Tara (1). Her name is derived from the moonstone (Skt. chandrakanta), the radiant gemstone that represents the moon (chanda) as one of the nine planets (navagraha). Chandrakanti is often represented standing upright in samapada posture, but here she is shown seated in vajra-posture upon a white moon disc and a pink lotus. Chandrakanti is peaceful and white in colour, with three two-eyed faces, and twelve arms. Her central face is white, her right face is blue, and her left face is golden-yellow like the gold from the Jambu River. Her three faces represent the three kayas or 'Divine bodies of a Buddha', and her twelve arms represent the ‘twelve links’ in the chain of dependent arising. With her first pair of right and left hands joined at the level of her hips, she makes the dhyana-mudra of contemplation or meditation. With her lowered second pair of hands she holds a garland of flowers (right), and a dharma text (left). With her third pair of hands a golden vajra (right), and a golden treasure vase (left). With her fourth pair of hands a blazing jewel (right), and a bell (left). With her fifth pair of hands a golden wheel (right), and a blue utpala lotus flower (left). With her sixth pair of hands she holds aloft a khatvanga staff (right), and a golden flask of consecrated water (left). She is adorned with divine silks and jewel ornaments; crowned by red Amitabha Buddha, and her function is to pacify contagious diseases, bad dreams or nightmares, and the causes of untimely death. Kanakavarna Tara, or "Golden-coloured Tara", is the third of the twenty-one Taras, and she appears upon a twisting rainbow directly above Chandrakanti Tara (2). She is golden-yellow in colour, with one face, two eyes, and ten arms – which symbolize the ten paramitas or perfections. She sits in vajra-posture upon a golden sun disc and a multicolored lotus, and is adorned with the divine silk and jewel ornaments. Ushnishavijaya Tara, or "Tara with the Victorious (vijaya) Crown Protuberance (ushnisha) of the Tathagatas", is the fourth of the twenty-one Taras, and she appears upon a billowing cloud directly above Kanakavarna Tara (3) in the top right corner. She is golden-yellow in colour, with one face, two eyes, four arms, and she sits with her legs loosely crossed in sattva-paryanka posture upon a white moon disc and a yellow lotus. Her first right hand is held at the level of her knee in the boon-granting varada-mudra of supreme generosity, whilst her second right hand holds aloft a rosary. With her first left hand she holds aloft a golden flask of consecrated water, and with her second left hand a golden club with a blazing jewel at its top. She is adorned with the divine silk and jewel ornaments, and her four arms symbolize her victory over the four maras. She is crowned by green Amoghasiddhi Buddha, and her main functions are to neutralize all poisons, overcome the lord of death, and to confer health and longevity. Humsvaranadini Tara, or "Tara Proclaiming the Sound of HUM", is the fifth of the twenty-one Taras, and she appears upon a billowing cloud directly to the right of Ushnishavijaya Tara (4). She is golden-yellow in colour, with one face, two eyes, and two arms. She is adorned with the divine silk and jewel ornaments, and sits in sattva-paryanka posture upon a golden sun disc and a pink lotus. Her right hand is held at the level of her knee in the abhaya-mudra of protection or dispelling fear. Her left hand is held before her heart in the gesture of giving refuge, and with her thumb and second finger she holds the stem of a golden lotus that blossoms at the level of her left ear. She is crowned by red Amitabha, and her main functions are subjugation and to liberate from all fears. Trailokyavijaya Tara, or "Tara Victorious over the Three Worlds", is the sixth of the twenty-one Taras, and she appears upon a billowing cloud directly to the right of Humsvaranadini Tara (5). She is ruby-red in colour, with one face, two eyes, and four arms. She is adorned with the divine silk and jewel ornaments, and she sits in sattva-paryanka posture upon a golden sun disc and either a red or yellow lotus. Her golden sun seat indicates that she free from all illusions regarding the destinies of all sentient beings. With her first right hand she holds aloft a golden vajra, and with her second right hand a blazing wisdom sword. With her first left hand held aloft she makes the threatening tarjani gesture with her raised index finger, although in this painting she is shown making the abhaya-mudra of fearlessness. With her second left hand she holds a rope-snare in front of her heart, with her index finger raised in the threatening tarjani gesture. She is crowned by red Amitabha, and her main function is to purify the negativities of all elemental forces throughout the ten directions. Vadipramardani Tara, or "Tara Who Crushes All adversaries", is the seventh of the twenty-one Taras, and she is depicted upon a billowing cloud directly to the right of Trailokyavijaya Tara (6) in the top right corner. She is wrathful in appearance with upward-streaming hair, and is often show standing in pratyalidha posture and wearing a tiger-skin loincloth. But here she is depicted sitting in sattva-paryanka posture, like the three other cloud-borne Taras that appear in the top row of this painting. Vadipramardani Tara is fierce and black in colour, with a wrathful expression, two piercing eyes, four arms, and she sits in sattva-paryanka posture upon a golden sun disc and either a yellow or red lotus. Her body is adorned with divine silk and jewel ornaments, and her tawny hair-locks are adorned with snakes and blaze upward like fire. With her first right hand she holds a golden wheel, and with her second right hand she wields a blazing iron sword. With her first left hand she holds a rope-noose at the level of her navel, and with her second left hand she makes the threatening tarjani gesture with her raised index finger, although in this painting she is shown making the abhaya-mudra of protection. She is crowned by yellow Ratnasambhava Buddha, and her main functions are to triumph over all hostilities, and to transfer the consciousness of her devotees to the Pure Land of Akanistha at the time of their death. Vashitottamada Tara, the "Tara who Bestows Supreme Powers", is also known as Marasudhana Tara, or the ‘Tara who Crushes all maras", and she is depicted upon a twisting rainbow directly below Vadipramardani Tara (7). She sits in sattva-paryanka posture upon a makara or ‘water-monster’ above a golden sun disc (or a white moon disc) and a red lotus. The makara, with its ferocious features and scrolling golden tail, symbolizes her ability to subdue all evil or demonic forces. Vashitottamada Tara is golden-yellow in colour, with one face, two eyes, four arms, and a wrathful frown. With her first right hand she holds a branch of an ashoka tree in front of her heart, and with her second right hand (in boon-granting gesture) she holds a radiant jewel. With her first left hand she holds a blue utpala lotus, which symbolizes her purity or freedom from all defilements. With her second left hand she holds a golden flask, with which she bestows supreme powers and blessings upon all beings. She is adorned with the divine silk and jewel ornaments, and crowned by green Amoghasiddhi Buddha. Her main function is to destroy the obstructions (maras) to enlightenment and overcome wrong views. Her rites also pertain to the ‘completion stage’ (Tib. rdzogs-rim) of tantric meditation practice. In the Suryagupta tradition Khadiravani Tara frequently occurs as the ninth of the twenty-one Taras, although Varada Tara (described below) may also occupy this ninth position. In this particular thangka the main central figure of Green Tara as Khadiravani Tara appears as the ninth of the twenty-one Taras. The Sanskrit term khadiravani refers to a grove (vana) of fragrant acacia (khadira) trees, and this form of Green Tara is usually depicted with her two attendant deities, peaceful yellow Marici to her right, and fierce blue-black Ekajata to her left. Here Khadiravani Tara is depicted in the traditional form and posture of Green Tara, with the golden disc of the sun forming her backrest and with her two hands holding the stems of blue utpala lotuses. Varada Tara sits in vajra-paryanka or sattva-paryanka posture upon a white moon disc and a red lotus. She is peaceful and red in colour, with one face, two eyes, and four arms, and adorned with the divine silk and jewel ornaments. Like Pravira Tara (1), the first of the twenty-one Taras, she holds a vajra and bell with her first pair of right and left hands joined above her crown in the gesture of ‘Great Bliss’. With her extended second right hand she makes the mudra known as ‘Snapping the fingers in the gesture of dance’. With her second left hand she holds a fruit-bearing branch of an ashoka tree, from the leaves of which fall a ‘rain of jewels’ that satisfy the desires of all beings. She is crowned with green Amoghasiddhi Buddha, and her main function concerns rituals of consecration. Shokavinodana Tara, the "Tara who Dispels all Sorrows", is the tenth of the twenty-one Taras, and she appears on the horizon directly below Vashitottamada Tara (8). She sits in sattva-paryanka posture upon a white moon disc and a red lotus, and is adorned with the divine silk and jewel ornaments. She is beautiful, peaceful, and red like ruby or coral, with one face, two eyes, and four arms. With her first pair of right and left hands joined together at her crown, she makes the palms-folded gesture of ‘Great Joy’ (Skt. mahamudita-mudra). With her second right hand she wields aloft a blazing sword, and with her second left hand she holds a branch of an ashoka tree that bears red flowers. She is crowned by green Amoghasiddhi, her function is to dispel sorrow, and her rites are for entering the mandala. Jagadvasi Tara, the "Tara who Summons all Beings", is also known as Apadanasini, the ‘Dispeller of misfortune’, or as Vipannirbarhana. As the eleventh of the twenty-one Taras, she appears directly below Shokavinodana Tara (10). Jagadvasi Tara sits in alidha posture upon a golden sun disc and a red lotus, with her right foot slightly extended. She is fierce and black ‘like the colour of darkness’, with one face, two piecing eyes, and two arms. With her raised right hand she holds an iron hook, with which she ‘summons the eight great planets from the eight directions’. With her left hand she may either hold another iron hook that ‘dispels misfortune’, or a ‘magical noose’, or both a hook and a noose as twin attributes of subjugation. But in this painting she is shown holding only a magical rope-snare in front of her heart, with her index finger raised in the threatening tarjani gesture. She is crowned by yellow Ratnasambhava, and adorned with the divine silk and jewel ornaments. Her main function is to liberate from hunger, thirst and poverty, and to increase the enjoyment of all beings. Mangalaloka or Mangalavabhasa Tara, the "Tara of Auspicious Light", is also known as the ‘Granter of Prosperity’, and as the twelfth of the twenty-one Taras she appears directly below Jagadvasi Tara (11). Mangalavabhasa Tara sits in vajra-posture upon a white moon disc and a multicolored lotus. She is peaceful and golden-yellow in colour, with one face, two eyes, and eight arms. She is adorned with the divine silk and jewel ornaments, and a white crescent moon (not shown) adorns her crown. With her first right hand she holds an iron trident before her breast, and with her first left hand she presses a radiant jewel to her heart. With each of her second right and left hands she wields aloft two identical iron hooks. With her third pair of right and left hands she holds a vajra and a club; and with her fourth pair a sword and a golden flask. She is crowned by red Amitabha, and her main function is to grant auspicious aspirations throughout all space and time, and her rites pertain to the sacrificial fire-offering or homa ritual. Paripacaka Tara, or "Tara the Ripener", is the thirteenth of the twenty-one Taras, and she appears directly below Mangalavabhasa Tara (12). In this thangka Paripachaka Tara appears as one of the two extremely wrathful aspects of Tara that occupy the bottom corners of this painting, both of whom abide within a blazing mass of awareness fire. Above a landscape of dark clouds and sharp rock peaks, Paripacaka Tara stands upon a golden sun disc and a red lotus in striding alidha posture, with her left leg bent and her right leg extended. She is extremely fierce and wrathful, ruby-red in colour, with four arms, one face, and two round and bloodshot eyes. The tawny locks of her matted hair stream upwards, and the intense radiance of her powerful body emanates as the blazing mass of fire within which she abides. Her face bears a terrible frowning expression, with trembling eyebrows and cruel lips, which are bared to reveal her four sharp canine teeth and twisting tongue. Her naked body is adorned with ornaments of gold and human bone, and she wears a billowing scarf of green silk. With her first right hand she wields aloft an iron sword, and with her first left hand she holds a golden wheel. With her second pair of right and left hands she holds the drawn string of a bow in front of her heart, with its arrow aimed at the heart an enemy. She is crowned by red Amitabha, and her main function is to subdue all hindrances and impediments. Paripacaka Tara may also be represented in a less ferocious or 'semi-wrathful’ form, where she is not naked, wears no bone ornaments, and is adorned with the traditional divine silks and jewel ornaments. She may also occasionally be represented with three eyes, with her hair bound up into a topknot, and with her arrow and bow held separately in her extended right and left hands. Bhrikuti Tara, or "Frowning Tara", is also known as Calad-Bhrikuti Tara, or "Shaking Frowning Tara", and as the second extremely wrathful aspect of Tara depicted in this thangka, she appears amidst a blazing mass of wisdom-awareness fire in the bottom left corner. Bhrikuti Tara stands in striding alidha posture with her right leg extended, and with each of her feet trampling upon a human corpse that crouches upon the golden sun disc of her orange lotus throne. Her body is black and terrible, with six arms, and three wrathful faces - each of which has three round, angry and piercing eyes. Her tawny and matted hair-locks stream upwards against the blazing mass of fire within which she abides, with the jagged rocks of the lower landscape appearing behind her. Her principal face is black, her right face white, and her left face red. Each of her faces has an angry frowning expression, with trembling eyebrows and contracted lips, which are bared to reveal her four white canine teeth and twisting red tongue. Each of her faces is adorned with a five-skull crown, and human entrails hang from the mouth of her principal face. Bhrikuti Tara’s powerful body is adorned with ornaments of gold and bone, a garland of fifty severed heads, a tiger-skin loincloth, and a long serpent that forms her sacred thread. As an upper garment she wears a shawl of flayed human skin, the arms of which are knotted across her shoulders, with the head and legs hanging behind her back. With her first pair of right and left hands she holds an iron sword and a skull-cup filled with human blood. With her second pair an iron hook and a rope-noose, and with her third pair a skull-topped club and the yellow four-faced head of Brahma. She is crowned by Amoghasiddhi, her function is to destroy all harmful thoughts with her frown, and her rites pertain to the protection circle. Mahashanti Tara, the "Great Peaceful Tara", is also known as Kalyanada Tara, the "Giver of Good", and as the fifteenth of the twenty-one Taras she appears directly above Bhrikuti Tara (14) and below Pravita Tara (1). Mahashanti Tara is peaceful and white in colour, with one face, two eyes, and six arms. She sits in vajra-posture upon a white moon disc and a white or pink lotus, and is adorned with the divine silk and jewel ornaments. With her first right hand she holds a rosary in front of her heart; with her second right hand she makes the boon-granting varada-mudra, and with her third right hand she holds a vajra-topped golden club. With her first left hand, which rests upon her lap in the dhyana-mudra of meditation, she holds the open blossom of a blue utpala lotus. With her second left hand she holds a golden flask of consecrated water, and with her third left hand she holds the stem of a blue utpala lotus that bears a text upon its open petals. She is crowned by red Amitabha, her main function is to purify all mental and emotional defilements that propel beings towards the lower realms, and her rites pertain to external cleansing or purification. Raganisudana Tara, the "Destroyer of All Attachments", is the sixteenth of the twenty-one Taras, and she appears directly to the right of Mahashanti Tara (15). Raganisudana Tara is beautiful but slightly wrathful in appearance, with a coral-red complexion, one face, three piercing eyes, and two arms. With her right knee raised she sits in sattva-paryanka upon a golden sun disc and an orange lotus, and is adorned with the divine silk and jewel ornaments. With her right hand she holds an iron trident in front of her heart, which is described as piercing the body of an enemy. With her left hand she holds aloft a tree that bears both fruit and flowers, with her raised index finger making the threatening tarjani gesture. She is crowned by blue Akshobya Buddha, and her main function is to increase and cultivation discriminating awareness. Sukhasadhana Tara, the "Accomplisher of Bliss", is the seventeenth of the twenty-one Taras, and she appears directly to the right of Raganisudana Tara (16). Sukhasadhana Tara is peaceful and orange in complexion, with one face, two eyes, and two arms. With her right knee slightly raised she sits in sattva-paryanka posture upon a golden sun disc and a white lotus. She is adorned with the divine silk and jewel ornaments, and with her two hands she holds the white disk of a full moon in front of her heart. She is crowned by green Amoghasiddhi Buddha, and her function is for ensnaring thieves, enemies and hostile forces. Vijaya Tara, or "Victorious Tara", is the eighteenth of the twenty-one Taras, and she appears directly below Sukhasadhana Tara (17). Vijaya Tara is peaceful and white in colour, with one face, two eyes, and four arms. She sits in sattva-paryanka posture upon a goose with ‘fine wings’, a white moon disc and a white lotus. With her first pair of right and left hands joined together on the crown of her head in the 'gesture of joy' (mudita-mudra), she holds aloft two identical iron hooks. With her second right hand resting upon her knee she makes the boon-granting varada-mudra, and with her second left hand she holds the stem of a blue utpala lotus that supports a book on its open petals. She is adorned with the divine silk and jewel ornaments, crowned by Amitabha, and her main function is to cure snakebites and naga-related diseases such as leprosy. Duhkhadahana Tara, the "Consumer of Suffering", is the nineteenth of the twenty-one Taras, and she appears directly to the left of Vijaya Tara (18). Duhkhadahana Tara is peaceful and white in colour, with one face, two eyes, and two arms. With her left foot slightly lowered she sits in ardha-paryanka posture upon a golden sun disc and a white lotus. With her two hands she holds a triangular brazier in front of her heart. She is adorned with the divine silk and jewel ornaments, crowned by white Vairocana Buddha, and her main function is for pacifying dreams and liberating beings from imprisonment or captivity. Siddhisambhava Tara, the "Source of Attainments", is the twentieth of the twenty-one Taras, and she appears in the sky directly below Humsvaranadini Tara (5). Siddhisambhava Tara is peaceful and orange in colour, with one face, two eyes, and two arms. She sits in sattva-paryanka posture upon a white moon disc and a white or red lotus. She is described as holding a golden vase in front of her heart with both of her hands, which grants all attainments and pacifies all diseases. But here she is shown holding a jewel-topped golden vase in her right hand, while with her left hand resting upon her knee in varada-mudra she holds a radiant gem. She is adorned with the divine silk and jewel ornaments, and crowned by green Amoghasiddhi. Her function is to alleviate all infectious diseases and bodily afflictions, and her rites pertain to the attainment of invisibility. Paripurana Tara, the "Perfecter", is the last of the twenty-one Taras, and she appears in the sky directly below Trailokyavijaya Tara (6). Paripurana Tara is beautiful, semi-wrathful and white in colour, with two arms, one face, and three piercing eyes that represent the ‘three doors of liberation’. With her left knee raised she sits in sattva-paryanka posture upon a white moon disc and a red lotus, which rests upon the back of a ‘miraculously born’ bull. She is adorned with gold ornaments, a tiger-skin loincloth, and she wears a flayed human skin as an upper garment or shawl. With her raised right hand she holds a trident-spear, the three points of which pierce the ‘three poisons’ (ignarance, craving, and aversion) of cyclic existence. With her left hand she holds a pearl rosary in front of her heart, symbolizing her inexhaustible compassion. She is crowned by Ratnasambhava, and her function is to overcome the fears caused by demonic possession, zombies and yaksha spirits. Her rites pertain to ‘sky-going’, or reaching the Pure Land of Akanistha in this very lifetime. Paripurana Tara may also be depicted sitting in ardha-paryanka posture with either her left or right foot lowered. She may also wear an upper garment of silk rather than a flayed human-skin, a five-skull crown instead of a jeweled-tiara, and her trident and pearl rosary may be depicted in her left and right hands instead.